Hong Kong (October 20, 2017) – The organizers of the annual Hotel Investment Conference Asia Pacific (HICAP), announced the winners for the Reggie Shiu Development of the Year, Single Asset Transaction of the Year, and the M&A Deal of the Year Awards. The awards were presented at the 28th annual HICAP, on 20 October 2017 at the InterContinental Hong Kong. 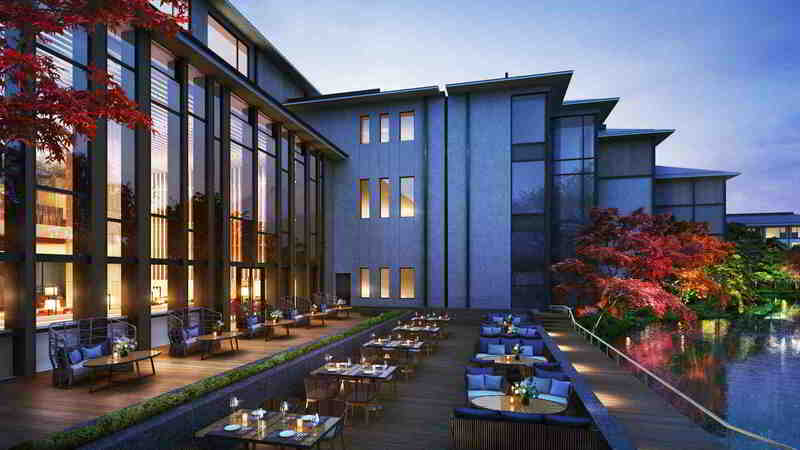 Four Seasons Kyoto (Japan) was named Reggie Shiu Development of the Year. Integrated with 800-year old historical gardens, the Four Seasons Kyoto respects the old urban scenery with its architectural design, while introducing a new interpretation of Japanese design in its interiors with centuries old local artisan products interspersed throughout. The 123 guest rooms and suites, plus 57 residences, overlook the expansive and well-tonsured gardens. Four dining options include an exclusive sushi restaurant, a modern brasserie, lounge and a garden teahouse used for meditative tea ceremonies by day that transforms at twilight into a bar serving fine sakes. The owner is Berjaya Corporation. The operator is Four Seasons Hotels & Resorts. The architect is Kume Sekkei, Jun Mitsui Associates (Porte Cochére), Yamamoto Atlelier (Tea House). The interiors are by Hirsch Bedner & Associates (guest rooms, function rooms, public areas, pool and spa), Kokai Studio (Brasserie), and STRICKLAND (Sushi Wakon). The exterior designer is Landscape Design. The development cost was JPY40 billion (USD368 million). Finalists in this category also included Alila Fort Bishangarth (Jaipur, India) and Bawah Island (Anambas Archipelago, Indonesia). Hyatt Regency Osaka (Japan) was named Single Asset Transaction of the Year. Acquired for JPY 16 billion (USD147.45 million) by Hoshino Resorts REIT from Hong Kong based Gaw Capital Partners (GCP) in November 2016, this deal represents the largest non-sponsor REIT hotel transaction in Japan to date. The hotel is a rare and desirable transaction and an opportunistic buy for Hoshino Resorts REIT, being one of the only high-quality, full-service internationally-branded hotels in the mostly limited-service Osaka market. The deal also involved a complicated land lease negotiation with the city of Osaka. Since its acquisition by GCP in 2014, the hotel has seen improved profit margins from market growth, cost management and energy investment. Its turnaround and subsequent sale capitalizes on increased investment interest in one of Japan’s fastest growing markets. Savills was the buyer’s advisor. Finalists in this category also included Hilton Melbourne South Wharf (Australia) and Novotel Melbourne on Collins (Australia). There was a tie in the M&A Deal of the Year category. Both China Lodging Group’s (Huazhu Hotels) acquisition of Crystal Orange Hotel Holdings and V Hotel Management’s acquisition of Premier Inn’s Thai portfolio were named M&A Deals of the Year. China-based multi-brand hotel company China Lodging Group’s subsidiary, China Lodging Holdings, acquired all of the equity interests of leading boutique hotel operator Crystal Orange Hotel Holdings' shareholders for approximately USD531.9 million. Announced in Feb 2017, the deal closed May 2017. Crystal Orange’s positioning and style will complement Shanghai-based China Lodging’s coverage and development capability in China, as well as its corporate philosophy and brand portfolio as one of China’s largest hotel groups. China Lodging Group has approximately 620 leased hotels — over 2,070 managed/franchised hotels and approximately 80 franchised hotels in operation and over 20 leased hotels and approximately 660 managed/franchised and franchised hotels under development. Beijing-based boutique hotel operator Crystal Orange was founded in 2006. V Hotel Management’s acquisition of Premier Inn’s Thai portfolio represents Singapore-based V Hotel Management’s first hotel investment in Thailand in line with their strategy to expand their offering of affordable midscale accommodation in the region, and seller WHRI’s divestment of their Thai portfolio as part of their withdrawal strategy of the Premier Inn business in Asia. The acquisition was completed in June 2017 for THB 1.4 billion (approximately USD42.3 million). The portfolio was acquired with vacant possession, enabling the buyer to establish presence in two of Thailand’s key tourism destinations with an operator of their choice. Additionally, the properties were available with BOI foreign ownership privilege, allowing the buyer to hold 100% ownership. The transaction was one of only a few hotel portfolio sales ever to be transacted on the open market in Thailand. JLL Hotels & Hospitality Group was the seller’s advisor for this transaction. For additional information on HICAP visit www.HICAPconference.com. Northstar Travel Group is the global leader of business intelligence, information, data, research, digital marketing services and events for senior-level professionals in the travel, meetings and hospitality industries. The Northstar portfolio includes; Travel Weekly, Travel Weekly China, Travel Weekly Asia, TravelAge West, Business Travel News, The Beat, Travel Procurement, Web in Travel, Phocuswright, Burba Hotel Network, Successful Meetings, Meetings & Conventions, Meetings & Conventions China, Incentive, Association News, Sports Travel and 75 annual events in thirteen countries including leading events such as ALIS, HICAP, Phocuswright, TEAMS, Web in Travel, and Mountain Travel Symposium. Northstar is also the majority shareholder in Inntopia. Northstar Travel Groupis owned by EagleTree Capital and is based in Secaucus, NJ, with offices in New York, NY; Denver, CO; Los Angeles, CA; Winston-Salem, NC; Stowe, VT; Edwards, CO; Glen Ellyn, IL; Costa Mesa, CA; and global offices in Singapore, Beijing, and Shanghai.